Thank you Gareth for that introduction, it’s a pleasure to be addressing your centenary conference. Our movement was in its early days inspired by the actions of William Morris and Robert Owen. Owen spoke of “the union and co-operation of all for the benefit of each”. Those two words “union” and “co-operation” mean so much to our movement. They are our philosophy, and our institutions, our theory and our practice. This is an important landmark in your history, but more importantly this is a significant moment for our future. The energy and creativity of our movement helped us to deliver in June the biggest increase in the Labour vote since 1945. And that helped us deliver nine more Labour and Co-operative MPs from Brighton to Glasgow, bringing the total now to 38 in Parliament – more than in either 1945 or 1997. The strength of our movement – Labour, trade union and co-operative, and more importantly co-operating – has transformed us into a government-in-waiting. Next May we have local elections in cities and towns across England. Let’s build on the 900 Labour and Co-operative councillors we have. Today let’s set ourselves the challenge to make it over 1,000 Labour Co-op councillors on May 3rd. The Tories have devolved austerity to local councils and perversely areas with higher levels of poverty have been hit hardest. Councils have on average faced 40% cuts in their budgets. But in the face of this adversity councils such as Preston have responded with inspiring innovation. They brought together major local employers in their community, what academics call the anchor institutions, and Preston council worked with them to drive through a local programme of economic transformation. By changing their procurement policies, these anchor institutions were able to drive up spending in Preston by £75 million, protecting businesses and jobs. And they’re looking at the pension fund they are part of to see where investment can support local businesses, keeping the money circulating in their city. But perhaps most relevantly to you, the council is actively seeking opportunities to create worker-led co-operatives where there are gaps in the local supply chain. Our movement, the labour and co-operative movement, is brimming with passion, people and ideas. And our movement needs your ideas and I know our shadow cabinet values your input as well. This afternoon you’ll hear from shadow education minister Tracy Brabin, talking about our plans for a National Education Service, a vision for education in which institutions of learning co-operate rather than compete. And tomorrow our shadow International Development Secretary Kate Osamor, herself a Labour and Co-operative MP, will address you to outline our international policy based on our values of peace, justice and co-operation. We live in a world riven by conflict, spurred on by ego and neo-imperial ambition. Never has the time been more important to restate our commitment to the UN Charter, the third clause of which states its aim “To achieve international co-operation in solving international problems”. With the problems facing us of nuclear proliferation, climate change, the global refugee crisis, the humanitarian crises in Syria, Yemen and of the Rohingya in Myanmar – a global vision driven by our co-operative principles is more necessary than ever. Whether its Donald Trump or Kim Jong-Un – macho posturing needs to give way to calm, rational co-operation. And across the world co-operatives play such a huge role as a spur to development, empowering women, bringing communities together. And today there are over a billion people worldwide who are members of co-operatives and I am proud to say that I am one of them. We need co-operative values at home and abroad. Our economy is failing to deliver. For millions of people the current system is failing to deliver secure jobs, failing to deliver secure housing, and failing to deliver rising living standards. Yet this is the system which exploits the many for the profits of a few, that the Conservatives want to defend. They want to conserve the privilege of the few. Philip Hammond says that Labour poses an “existential challenge to our economic model” – Yes, we do. Their economic model is broken. It doesn’t work for most people. Even the International Monetary Fund thinks inequality and low taxes for the richest are harming the economy. That’s why Labour is now the new mainstream, developing a new consensus of how to run an economy for the many not the few. This new consensus will reward the real wealth creators – that means all of us. It will genuinely value people and communities – and invest in them. It will create an economy fit for the 21st Century with a state that’s not afraid to act when something goes wrong but, more importantly, also proactive to make sure things work in the first place. Unlike Mr Hammond and the Conservatives I don’t think it’s acceptable that chief executives get 180 times the pay of their average worker. I don’t think it’s acceptable that when hospital A&Es are closing the government can fund another tax giveaway for big business. And I don’t think it’s right that landlords can be paid £10 billion a year in housing benefit without even the requirement that the home is fit for human habitation. The Conservatives believe everyone is motivated by the same base interests – selfishness and greed. For all their rhetoric they don’t even begin to understand the entrepreneurial spirit they claim to champion. When I meet entrepreneurs, and those trying to start their own business, their motivations are to express their creativity, serve their community, meet people’s needs, to create an income for themselves and jobs for others. Their inspiration is often closer to the pragmatic principles of the co-operative movement than it is to the abstract ideology of Milton Friedman. So I say to people thinking of starting an enterprise or those struggling to run a start-up – consider the co-operative model and get the support you need from Co-operatives UK. But conference, we have to acknowledge the obstacles to the Co-operative model. Too often people who want to change their community or start a business don’t know about the co-operative movement. And yet co-operative start-ups are more robust than other forms of business start-up – twice as likely to still be in operation five years later. The co-operative sector in the UK is one-fifth of the size of Germany’s – under-valued and under-appreciated. A Labour government will change that. Because we support co-operative principles, they are Labour principles. To build a new high-investment economy for the 21st century we must get Brexit right. That means securing full access to the Single Market and using the powers we get back from Brussels to help transform our economy. The Tories are transparently failing Britain in the Brexit negotiations. They are making a shocking mess of Brexit. They are split down the middle, negotiating with each other instead of the EU. With each passing day they are driving us closer to a ‘no deal’ Brexit. Let’s be clear: no deal is the worst possible deal. It would leave us with World Trade Organisation tariffs and restrictions instead of the full access to European markets we need. The risk would be that key manufacturers leave for the European mainland taking skilled jobs with them. In sector after sector, ‘no deal’ could prove to be an economic disaster. Theresa May’s cabinet of chaos is risking a jobs meltdown across Britain. A powerful faction of the Conservatives want a no-deal outcome because they think they can use it to turn our economy into a deregulated tax haven. We must not let them. So when we talk about taking natural monopolies into public ownership we’re not inspired by the centralised and remote models of the 1940s and 1950s. We’re determined to create models of ownership that involve workers and consumers based on Co-operative principles, whether that’s at community, regional or national level. Last year the profit margins at the big six energy firms hit their highest level on record, falling wholesale costs were not passed on, and since then providers like British Gas have hiked prices again by 12.5%. Because energy is run for profit, for the interests of the few over the many. Our shadow energy team has just returned from Denmark, a country where the grid is publicly owned and municipal and co-operative ownership dominates. and by 2020 Denmark will get 50% of its electricity from wind. and failing to deliver clean air. And look at what has happened since privatisation: The company has made £195 million in profits through the sale of assets and closed one in 10 delivery offices, running down and asset stripping the service. They’ve paid out over £600 million in dividends to private shareholders – that’s £344 every minute since privatisation. And of course the public business was sold off on the cheap by the Lib Dem and Tory coalition. That’s why we have committed to bringing Royal Mail into public ownership – run in the interest of the public, Royal Mail workers and service users. 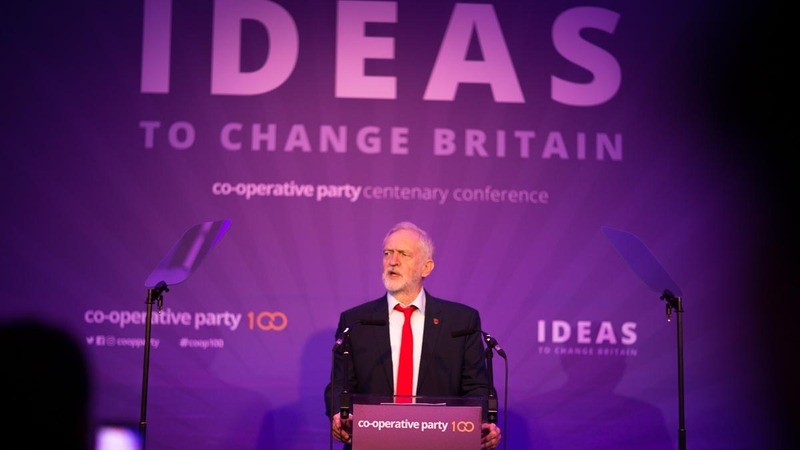 I want to end my speech with a challenge to you in the Co-op Party, and to those in the wider co-operative movement – come forward with your ideas, your enthusiasm, your energy. We have an opportunity in this period of opposition to prepare for government – a Labour government that will transform our economy to work for the many not the few. So contribute your ideas into the Labour Party. Two areas where I think we can do something practical in the here and now. We know that co-operative start-ups are more likely to survive than conventional business start-ups so what can you as a movement do now, to engage with entrepreneurs to take up the co-operative model, working with local chambers of commerce and the Federation of Small Businesses. Let’s get Labour councils, the co-operative movement, and small business organisations working together to promote the co-operative model. And finally, I believe that we are entering a period of unprecedented opportunity for socialist politics and co-operative principles. New technology is empowering participation, new social movements today are horizontalist rather than hierarchical, networked rather than top-down. That’s why when I ran to be Labour leader I said I wanted our party to be a movement. And today we are with well over half a million members who joined because they want to be involved and want to participate in our movement. The top-down model of organisation, whether in politics, the media or in business, is being challenged and is breaking down. The technology of the digital age should be empowering workers, enabling us to co-operate on a scale not possible before and yet too often it has enabled a more rapacious and exploitative form of capitalism to emerge. Look at Uber, Deliveroo, and others. The platforms these companies use are the technologies of the future. But, too often, their business models depend not on technological advantage, but on establishing an effective monopoly in their market and using it to drive wages and conditions through the floor. Governments have to make sure that regulation keeps pace with changing technologies. But sensible regulation of working conditions would not only improve the lot of existing workers – and yes, despite what some firms try to claim, they are workers – it would mean that new businesses could survive in the market. Digital platforms are opening up huge opportunities for horizontal, more democratic, forms of organisation to flourish. Imagine an Uber run co-operatively by their drivers, collectively controlling their futures, agreeing their own pay and conditions, with profits shared or re-invested. The next Labour Government, working with you, can make that a reality. The biggest obstacle to this is not technological but ourselves. We must have the confidence and organisational skill to make it happen. That’s why we commissioned our report on Alternative Models of Ownership. To start asking fundamental questions about who should own our economy in the digital age, and how to ensure that it’s enormous potential benefits serve the many, not the few. Its authors recommend that co-operatives be supported by government through access to finance, through legal changes to level the playing field for cooperatives in the market, and through a better government procurement policy, so that public money is being used to support companies that serve the public good. To prevent just the few benefiting from the “rise of the robots” the report suggests we consider higher minimum wages, a shorter working week, profit sharing schemes, or putting the ownership and control of the robots in the hands of those who work with them and come to rely on them. We don’t have all the answers yet but are thinking radically about how we can shape the next thirty years to use the power of new technology to make our economy work for the many not the few. Today Labour and Co-op parties are the largest in Britain with more members than all the other parties combined. We are winning the arguments … with support for public and co-operative ownership. And we are inspiring millions. We are a movement ready to take office and ready to shape our country for the future.